The calendar just turned its pages to 2015. We have tiny and versatile cameras like the GoPro Hero 4 filming 4K video, camera companies making 50-megapixels DSLRs, and artists making mind-blowing stop-motion/hyper-lapse/time-lapse films. So why is it still so hard for artists and big brands to easily connect to collaborate on photo and video projects? That is a question SmartShoot founders Justin McCarthy and John McWeeny asked themselves back in 2012 when they founded their San Francisco-based company. 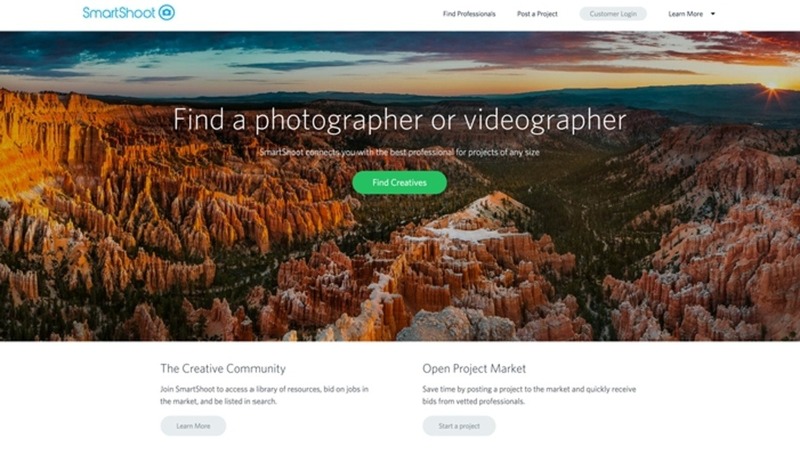 SmartShoot’s aim is to connect big brands like Yelp, BMW, and CBS who are looking for original photo and video content with the visual artists who best fit the criteria for the job. We built SmartShoot with the guiding principle that a good marketplace needs to work well for both sides — satisfying one side at the expense of the other, doesn’t work for anyone in the long run. The majority of our jobs are “direct requests” to work with a particular photographer and are offered exclusively to the photographer the customer found on the SmartShoot website. This model allows brands to actively review the previous work and portfolio of any photographer that fits their criteria. If a brand posts an “Open” project, we will only display that job to qualified photographers based on an algorithm we have developed. This algorithm weights hand-vetting/scoring by our production team, a high-quality profile page, proven skills, high reviews/ratings, on-time delivery percentage, and high conversion. 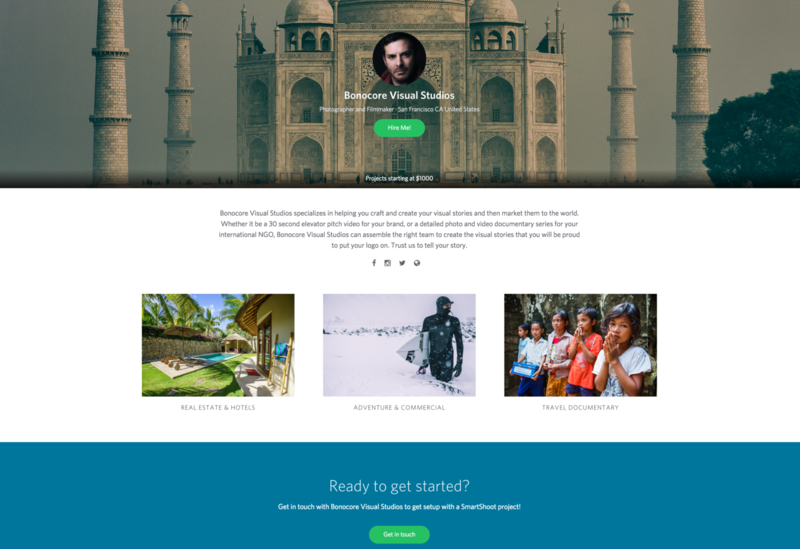 Recently leaving my full-time job at SmugMug, I was intrigued about the possibility of having a tool that would help me connect with clients who were willing to pay for jobs that interested me. Before being hired at SmugMug, I used to photograph weddings and events, but, it just wasn't for me. While the money was good, those high-stress jobs were not good for my health. For some reason, I just can't do them, which is why I highly respect the people that can. I would much rather be traveling and documenting an adventure for a brand's ad campaign or a destination's tourism board. I even photographed real estate for years, although not nearly as good as Mike Kelley. But that was a low-stress environment, and I wouldn't mind taking some of those types of jobs again. Slowly moving into video, maybe I could even find some corporate video jobs to help hone my skills while making a little money too. Introduction Video For A Doctor's Office : 1-2 minute piece to show how nice the office and the doctor are. Video Edit : A company needs someone to take 80 nicely designed slides and turn it into an animated video with a voice over and happy music. Event Photography : A person needs a photographer to capture him and his fiancé in a 45 minute religious ceremony and then go to San Francisco to take some "engagement type photos" ...Uh, so you're saying you want me to photograph your wedding. Company Commercial Video : A Yelp-like video, showing the best side of a company in a one to two minute inspirational video. Aerial Photo : A business needs a photographer to go on their roof and take some beautiful photos of the San Francisco Bay Area. Alright, now we are talking! This was listed next to each one of the above jobs. Now, don't get me wrong, none of those jobs seem extra time consuming, but less than $500? Then, something else caught my eye. A beauty company needs product and lifestyle photos. Budget: less than $5,000. Ah, that's the kind of money I dream about hitting my bank account. I am not much of an artificial light photographer, so I don't think I could get this job, but it was nice to see not every client expected top notch results on a $500 budget. Only time will tell if SmartShoot is right for me. I will keep an eye out, and maybe even bid on a lower paying job if it interests me, like the San Francisco skyline job. It seems there is a community of successful photographers on the site, like Jay W. from New York. His profile is preloaded with SmartShoot statistics that the company places on your profile, so the artist can't manipulate them. Jay has racked up an impressive 287 jobs, with a minimum rate of $2,000. Who knows what the final prices are for these jobs, but this photographer seems to be making a very nice, stable income through SmartShoot jobs. Now, obviously, that is not going to be the normal case for most of us, but it tells me that there is potential in this tool. I think the secret to success for all parties involved in SmartShoot (artists, clients, and of course, SmartShoot themselves) is that the more people get involved, the stronger their algorithm gets, and the more SmartShoot becomes a known destination for brands to find a photographer or videographer that fits into their projects. There will always be the low-end budget clients who refuse to pay more than $500. While I probably wouldn't bid on a job for less than $500, I sure do wish I had a tool like this when I first got into the industry. Those types of jobs seem great for artists who are just beginning and who would like the real world experience and a notch in their resume, all while making a couple bucks. But it's important for every photographer to never undervalue their work. The more we undervalue our work and get into bidding wars with other photographers, the more we as a community lose, and the more big name brands win. If we stand up as a group, and only work for what we are feel we are worth, the more the clients understand what results their budget will get them. For instance, if Mike Kelley starts taking jobs for less than $500, the entire real estate photography community loses. Have you used SmartShoot? If so, how has your experience been? If not, what are your initial impressions? Is it a tool that you can see yourself using? I would love to hear from you! I will come back and add updates on my experiences throughout the next month. 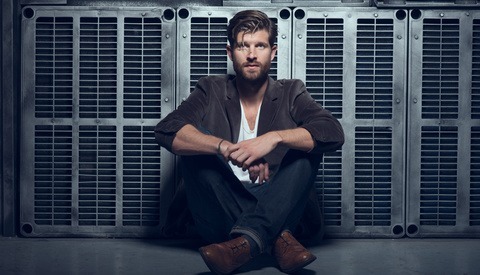 Michael is a full time photographer, traveler and workshop teacher based out of San Francisco, California. Michael's passion lies in international photojournalism, which has brought him to lead photography workshops around the globe. Michael has written guest articles for companies such as Matador Networks, SmugMug, and Borrow Lenses. Thanks for the article, Michael! I am the Director of Marketing at SmartShoot and happy to answer any questions anyone might have - either here or at casey.mccallister@smartshoot.com. As the "Director of Marketing" @ SmartShoot you probably get paid properly for your work. If you were to be hired through your website you wouldn't. Hypocrite. I've been working with SmartShoot for a few years now, and while its gotten me some great jobs there are definitely drawbacks. First and foremost being that you're signing away all your rights to the images to SmartShoot which means you're losing out on all potential future revenue from those images. 20% is a lot of money to have cut out. Especially when some of the job categories are already grossly underpaid (that doctor's office one springs immediately to mind, I looked at that and ran). Because SmartShoot doesn't screen their clients you can end up wasting a lot of time on back and forth with people who don't know jack about video or photo production. None of the time you spend back and forth is paid. Also, unlike a professional contract you would write up with a client there's no real consequence for clients if they flake on an appointment or aren't ready when you arrive. Living in Flake City USA (San Francisco) I've wasted a lot of time this way. Some clients have been frustrated with the extra wait for SmartShoot quality control to check my uploads before delivery. All of that said I still use it because it gives me access to more clients, some of whom have become regulars who I now work with directly without SmartShoot acting as middle man. For me that's what it really is, a lead generator that I can hopefully convert people into no middle man clients after the first shoot. Its also handy sometimes to just grab a simple or interesting job for a few extra bucks or just to have a different shooting experience. For students and those just starting out I think its invaluable. So, as with most things in life, some good and some bad. Show good work and bid high. Really awesome feedback Nathan. Yeah, I agree with that last line whole heartedly. Show good work and bid high! Yeah, like I said in the article, this would have been such a great tool when I was starting out. Thanks, Nathan! I appreciate your comment and happy to address some of your concerns. SmartShoot takes 20% only on open request jobs submitted to the entire marketplace. Since a change in profile browsing earlier this year, requests sent directly to one single artist are up 300%. SmartShoot takes only 10% on these jobs. Keeping in mind what artists pay agencies, we believe this is a fair price. We do try our best to speed up the process between client and artist. Having the customer pay half up front should encourage the process to speed through. If ever you're having trouble getting in touch with a client, don't hesitate to reach out to us and we will do our best to speed along the process. "Always work for hire"... but why the photographer doesn't have the option to opt for the freelance (non-work-for-hire) option? You know the cost is dramatically higher when its a work-for-hire job as this (by US laws) include every shot taken to being the property of the client aka employer, correct? Even if we put a contract up with our own terms that contraction the work-for-hire terms wouldn't the work-for-hire override the photographer's terms? The creative has the option to accept or ignore the fixed price jobs. Should they choose to accept, they are accepting the fixed price and the terms set by the contractor. The creative also has the option to ignore the fixed price jobs and only pitch non work for hire jobs. The system is set up to be friendly to creatives in that they can be as selective with only choosing jobs that agree with their business model. How about an option to pitch to the work-for-hire jobs to see if they're open to negations? Where I am interested in their job but for X and X terms instead? The contractor can simply have that option for that job or all jobs open to negations or not. Sounds like an idea I'm sure some contractors may be open to, correct? 20% is better than the 80% IStockPHoto takes from it's contributers ... of course the creatives at IStock TECHNICALLY retain the rights to their images. You;d have to pay me a lot to hand over my copyright. *As a client, I searched for wedding photographers in Melbourne, Victoria, Australia. The results that appeared were all American based photographers. I understand photographers can hop on an airplane, but my impression was 'the search feature is broken"
We're excited to have you, Mark! Do reach out any time should you have any questions. Quick question. When I click the job market tab there are only 4 projects listed. Any way to browse more jobs? In order to keep from overwhelming photographers with alerts and dragging jobs out, SmartShoot does its best to target what kinds of jobs are best for you and present those to you. The more you use SmartShoot, it will delivery you more jobs. There is also a chance that at this time there are a limited number of jobs in your area. Keep checking back to see if more jobs are added. Follow up with your username to casey.mccallister@smartshoot.com and I can narrow down more particular specifics. This is disgusting. Good job helping to facilitate the destruction of the photo industry. People wonder why we can't have nice things. Every job that I viewed was pennies on the dollar of what it should be. Your platform is shameful and hurts the industry for facilitating it. Just as shameful are the photographers that are willing to work for next to nothing for merely being able to "get the job". Furthermore if there was a complete list of jobs on your entire website, I would place my bet that damn near everyone undercuts the local market. Prove me wrong. Pick a random sampling of jobs and call local photographers in that jobs area for bids, then compare it to these companies "budget". You won't, because it would become apparent if it isn't already how despicable your practices are. And why would you even care, your taking a 20% cut for hosting a SEO platform. Thanks, Johnny. We appreciate your concerns. I'm more than happy to talk with you in further detail any time. You can reach me at casey.mccallister@smartshoot.com. Nah thats okay, rather never talk to your kind again. Just saw a job that was 2 days locational video work, 1 day post (multiple edits) multiple finished short promo interviews (5 min length) plus all the raw footage with a budget under $500 USD (so what? probably around $300 USD - $400 USD) that multiple Scabs showing serious interest on. If you do not see the fallacy in what you are doing... well i'm beyond proper words. HOLY! 500$ for 3-4 days worth of location work!?! Might as well fing wash dishes! The work would be more and be steadier! I charge almost that much for a 2.5 hour session to shoot products on white seamless. I was blown away at how they treat the photographers. Every listing that would get emailed to me had so much stress on "need full frame camera, 8000 MP, must have a tripod, etc. etc. etc.. It seems like the kind of camera you use means more than the actual work you produce. They have a lot of learning to do as a company. I even tried reaching out to give my feedback was never responded back to. Bad customer service as well, not to mention rates that undercut the market. Daniel, our customers create the jobs and job description. SmartShoot acts as the medium to deliver the proposals to our creatives. You can personally email me any time casey.mccallister@smartshoot and will be happy to listen to your feedback and direct you to anyone that can address your concerns. Michael have you heard or tried Thumbtack? If not, it is a great for start photo businesses or even hobbyists looking to help feed their gear costs. It's no top dollar jobs, but its a builder opportunity in my opinion ever since I joined last June I got about 9 jobs, which may sound low but know I'm in a less populated area than LA, Miami or NYC. I've seen nothing but crap jobs posted on SmartShoot by people wanting to take advantage of photographers. These are good for a laugh but that's about it. We appreciate you taking a browse, Eric! Be sure to keep checking back. New jobs are added all the time, and we frequently have high-priced jobs circulate through. I am not quite sure how the process works, but in all honesty if this business model is to have any sustainability it should work with the photographers in their markets to build a MINIMUM price that meets the market value. Some photography should be attainable for 500$ but what is the point in a middle man at the cost level? And lets (as a community) not let the client decree what they think they should pay for something, lets educate them on why it costs a certain amount. Again I don't know what this website of middle men do specifically, but it appears like hosting a platform of low paying jobs will gain them little respect in the photography community as a whole. Especially when it seems like they allow the client to limit the cost and allow desperate photographers to canibalize themselves. We already have Craigslist for that, why put lipstick on it?